Radiation has leaked from a crippled nuclear plant in tsunami-ravaged northeastern Japan after a third reactor was rocked by an explosion and a fourth caught fire in a dramatic escalation of the four-day-old catastrophe. The government warned anyone nearby to stay indoors to avoid exposure. In a nationally televised statement, Prime Minister Naoto Kan said radiation has spread from four reactors of the Fukushima Dai-ichi nuclear plant in Fukushima province, one of the hardest-hit in Friday's 9.0-magnitude earthquake and the ensuing tsunami that has killed more than 10,000 people. "The level seems very high, and there is still a very high risk of more radiation coming out," Kan said. "We are making utmost efforts to prevent further explosions and radiation leaks." This is the worst nuclear crisis Japan has faced since the atomic bombing of Hiroshima and Nagasaki during World War II. It is also the first time that such a grave nuclear threat has been raised in the world since a nuclear power plant in Chernobyl, Ukraine exploded in 1986. 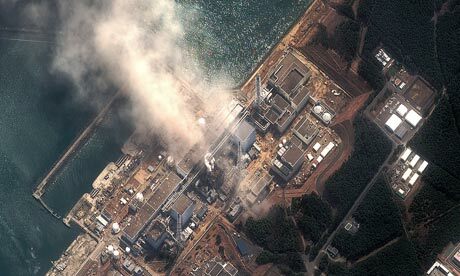 Kan warned there are dangers of more leaks and told people living within 19 miles (30 kilometres) of the Fukushima Dai-ichi complex to stay indoors to avoid radiation sickness. Some 70,000 people had already been evacuated from a 12-mile (20-kilometre) radius and 140,000 remain in the zone for which the new warning was issued. Three reactors at the power plant were in critical condition after Friday's quake, losing their ability to cool down and releasing some radiation. A fourth reactor that was unoperational caught fire on Tuesday and more radiation was released, Chief Cabinet Secretary Yukio Edano said. "It is likely that the level of radiation increased sharply due to a fire at Unit 4," Edano said. "Now we are talking about levels that can damage human health. These are readings taken near the area where we believe the releases are happening. Far away, the levels should be lower," he said. "Please do not go outside. Please stay indoors. Please close windows and make your homes airtight. Don't turn on ventilators. Please hang your laundry indoors," he said. He said a reactor whose containment building caught fire on Monday has not contributed greatly to the increased radiation. The radiation level around one of the reactors stood at 400,000 microsiverts per hour, four times higher than the safe level. Officials said 50 workers were still there trying to put water into the reactors to cool them. They say 800 other staff were evacuated. The fires and explosions at the reactors have injured 15 workers and military personnel and exposed up to 190 people to elevated radiation. The death toll from last week's earthquake and tsunami jumped on Tuesday as police confirmed the number killed had topped 2,400, though that grim news was overshadowed by a deepening nuclear crisis. Officials have said previously that at least 10,000 people may have died in Miyagi province alone. Millions of people spent a fourth night with little food, water or heating in near-freezing temperatures as they dealt with the loss of homes and loved ones. Hajime Sato, a government official in Iwate prefecture, one of the hardest-hit, said deliveries of supplies were only 10% of what is needed. Body bags and coffins were running so short that the government may turn to foreign funeral homes for help, he said. The nuclear crisis has also raised global concerns about the safety of nuclear power at a time when it has seen a resurgence as an alternative to fossil fuels. The Dai-ichi plant is the most severely affected of three nuclear complexes that were declared emergencies after suffering damage in Friday's quake and tsunami, raising questions about the safety of such plants in coastal areas near fault lines and adding to global jitters over the industry. Switzerland ordered a freeze on new plants, while Germany said it was suspending a decision to extend the life of its nuclear plants. The United States said it would try to learn from the Japanese crisis but that events would not diminish the US commitment to nuclear power. "When we talk about reaching a clean energy standard, it is a vital part of that," White House spokesman Jay Carney said. Meanwhile, 17 US military personnel involved in helicopter relief missions were found to have been exposed to low levels of radiation after they flew back from the devastated coast to the USS Ronald Reagan, an aircraft carrier about 100 miles (160 kilometres) offshore. US officials said the exposure level was roughly equal to one month's normal exposure to natural background radiation, and the 17 were declared contamination-free after scrubbing with soap and water. As a precaution, the carrier and other 7th Fleet ships involved in relief efforts had shifted to another area, the US said.